must be nearby. There! Three small baby birds were making themselves small, flattened out in their nest against each other, their camouflaged feathers blended beautifully with the texture and color of their surroundings, blurring their individual shapes. Nested at the base of bunch grass, their wide v-shaped beaks were the only feature that revealed their number. I called for Mike to come, look and photograph her chicks. Their mother had flushed out so swiftly that I had little time to observe her but noted what I could. 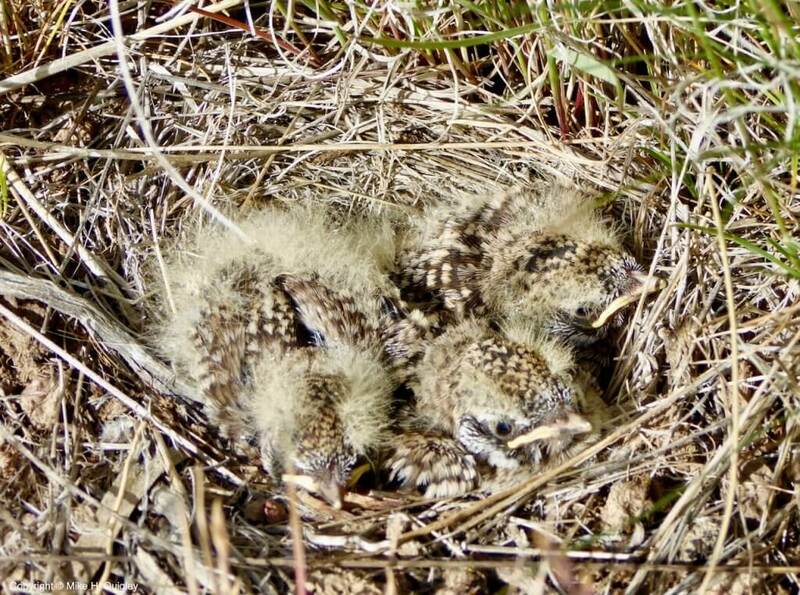 She was the size of a horned lark, with black tail feathers, white underbelly, grey back, black eye-stripe. I hoped it would be enough to identify her. We moved on, heading down off the ridge into the shallow basin with the fence line we were hesitant to cross during our return hike the day before. It had now become a reference point. Within minutes of seeing the baby birds, we spotted three antelope grazing on the slope to our right. They were alert and watching us. We stopped to look at them. Nothing happened at first and then they bolted, moving out of sight over a rise and into another basin. In just over an hour we had reached the far-point of yesterday’s hike. We continued on over the next small hill, dropping down in the direction of the scree slope we had observed the previous day. After peering down a narrow rock-filled slide between two towering pinnacles, more suitable to bighorn sheep than humans, and investigating a second slide equally uninviting, we found our path on the third try. “We can make it!” Mike announced. I noticed a few rock cairns during our descent as we zigzagged between rock outcroppings skirted with bunch grasses and a scattering of scarlet paint brush bristles poking up here and there. As we neared the top of the scree slope, a clear trail appeared leading to the canyon bottom. Clearly used by both humans and wildlife, this area saw more human activity than many of our other canyon hikes. belying his eightieth year. Joy exuded his body and he was growing younger with each step. Cumulus clouds were building overhead and the sun was hot in the canyon. When we reached Antelope Creek I commented that I would have to soak my shirt, head and hat in the creek water to keep myself cool enough to make the climb out. “Just go in clothes and all,” Mike suggested, which was something he was likely to do. 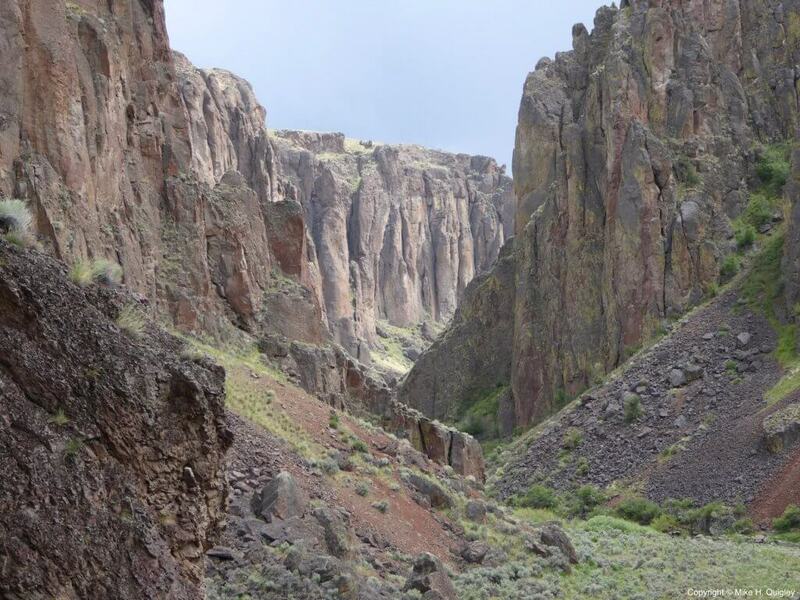 We hiked about three-quarters of a mile along the creek bottom, through willows, up and over boulders, around a corner and onto the confluence with the Owyhee, delighted to have made it! I found a large, somewhat flat-topped boulder on river left, about ten feet above stream level, for a rest stop. It also provided a clear view of the main canyon and kept us above the willows. A killdeer simulated injury in the sweeping gravel bar below us and continued its high-piercing warning call throughout lunch. It definitely had a nest somewhere on the bar, but it was too expansive to go looking for peeps. Besides, the adult bird was nowhere near the chicks at this point, having flown far from its nest to lure us away. The river was low and slow, running about 200 cubic feet per second. Willows had established themselves well out into the main channel over the years, altering the view of the canyon as we remembered it. A shadow fell over us as thunderheads began to shade the river corridor. The air temperature was now very comfortable atop our lookout. The vertical walls of rhyolite in hues of black, burnt sienna, and tan, were greater in height and more beautiful than I remembered in this canyon section. As I gazed out at the main river, I longed to be on it. Contemplating a solo trip, I wondered if I could accomplish such a journey and help bring more attention to the need to preserve this unique biome. Mike rested and I continued to daydream about the possibilities of such an expedition for another twenty minutes before packing up lunch and heading back up the creek. Rounding the first creek bend I looked up. In the distance I saw an enormous cave opening about 100 feet above the creek bottom and right next to the scree slope we had descended. How had we missed seeing it! I pointed it out to Mike. It had to be a rock shelter and we would take a better look at it when we began our steep climb to the ridge line. shallows. Many deep clear pools of water formed on the downstream side of cabin-sized boulders that punctuated the creek bottom. One of these pools was conveniently located near the hike-out point. A small sloping sandy beach leading to the water, with a polished rock shelf in the background, creating a smooth sand-free sitting area, lay on the opposite shore. A shallow crossing flowing out from the pool, with ample stepping stones, made it easy to reach. Within minutes, Mike had stripped and was in the water. By now, thunder clouds shaded the canyon. The sun appeared then disappeared with more frequency. Light ebbed and flowed along cliff walls, undulating from dim, dusky browns to a luminous golden glow. It had grown cool and light gusting winds made it more so. I knelt to feel the water’s temperature. “Perfect,” I thought to myself, for what might have been the small red-band trout darting about, and for a skinny dip on a hot canyon hike. But it was no longer hot, and I waffled, opting to soak only my shirt to keep me cool for the climb ahead. "Light ebbed and flowed along cliff walls, undulating from dim, dusky browns to a luminous golden glow." sheltered here when the cave floor was level and silt free, when the accoutrements of daily living were in place. Enemies could see you only at a distance, and from one direction. But from the level of the shelter the inhabitants would have had a clear view up and downstream. It would be easy to slip away undetected in advance of danger. 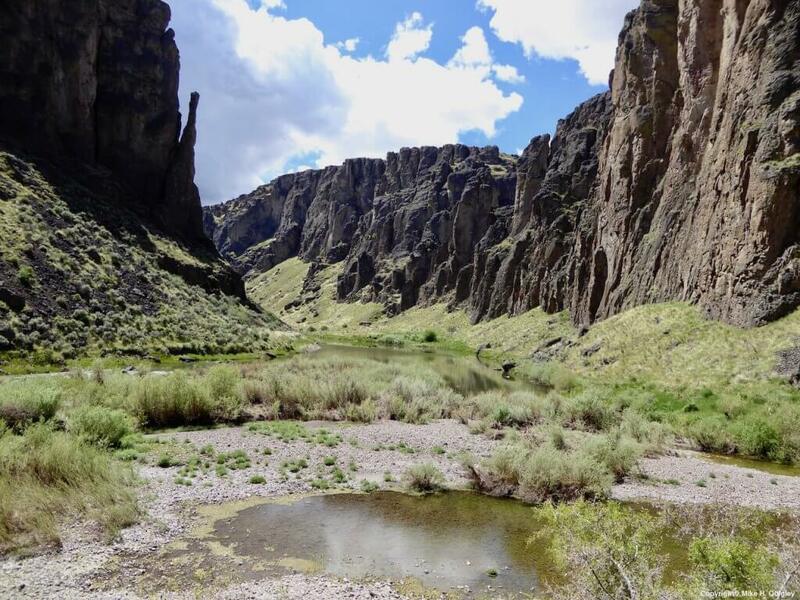 I wondered if during periods of rest from work, they enjoyed the view; the beautiful vertical walls and pinnacles of the canyon, contrasting colors of igneous rock, the soft green of a willow-lined creek bottom. Surely, it must have been so. We left the protection of the shelter and began our steep ascent out of the canyon, grateful for the shade of storm clouds and cooling winds. We could see dark grey sheets of rain advancing towards us and then, a flash of lightning overhead followed by a simultaneous explosion of thunder stopped us in our tracks as it reverberated off the walls of the canyon for a long time. We continued to the top of the scree field. I could feel rain drops beginning to hit my head and shoulders as the storm quickly advanced from the south. Mike was about fifty feet away from me. I looked for cover, but there were no rock shelters up here. I spotted a tall rock slab, which created a small L-shaped alcove, and found some marginal protection on its north face. We would also be somewhat protected on our west. There was a small wet seep on the west wall of the alcove. Soft mud with long green shoots that looked like the leaves of domestic iris poked up three feet high from the spongy earth. “Could they be cattails?” I wondered. I motioned for Mike to join me, and we hurriedly dug into our packs for light jackets and a warmer shirt. Within seconds, the deluge hit, with winds so strong from the south the rains blew sideways. We were well-protected from the down pour on the north face of our small nook. But then the wind died and the rain came roaring straight down. We pressed our bodies against the rock face, wishing ourselves flat as an empty tick, but anything protruding more than an inch was drenched. Water pooled in the dimples of our daypacks and dribbled down our backs. We were not warm. And now, we were wet. It seemed a long time before the rain began to subside. When it had diminished to a sprinkle I said, “Let’s go. We’d be warmer moving.” Mike agreed. the remaining 100 feet of the canyon, our boots grew heavy with mud. When we reached the ridge line the worst of the storm had blown over us and the air freshly scented of sage. Dense dark rain sheets hung in the west, the direction of our camp. “Looks like we’re in for another soaking,” I thought to myself. “We’ll never make it back to camp ahead of it,” I said to Mike. “We’ll make it,” he countered. Every step was dryer than the last. The dark grey veils of rain that seemed so ominous and close, moved to the north. In the hour and 15 minutes it took us to hike the uplands back to camp, the caking mud had worked off our boots. By the time we arrived, camp was dry. The solar shower water was warm, but I remained chilled from our soaking and a shower in the open air was no longer appealing. “Taking a shower?” Mike asked, when I moved the shower bag out of harm’s way. “But not today,” I replied. Rain drops had spattered the pickup sometime during the day and had left a dirty, dusty outline in their wake. But overall, our camp had escaped the worst of the storm. We seemed to be in a rain shadow of some sort and felt lucky to walk about in the dry. Did you know Antelope Creek has two rockshelters, and one of them has revealed a human history dating back 9500 years? 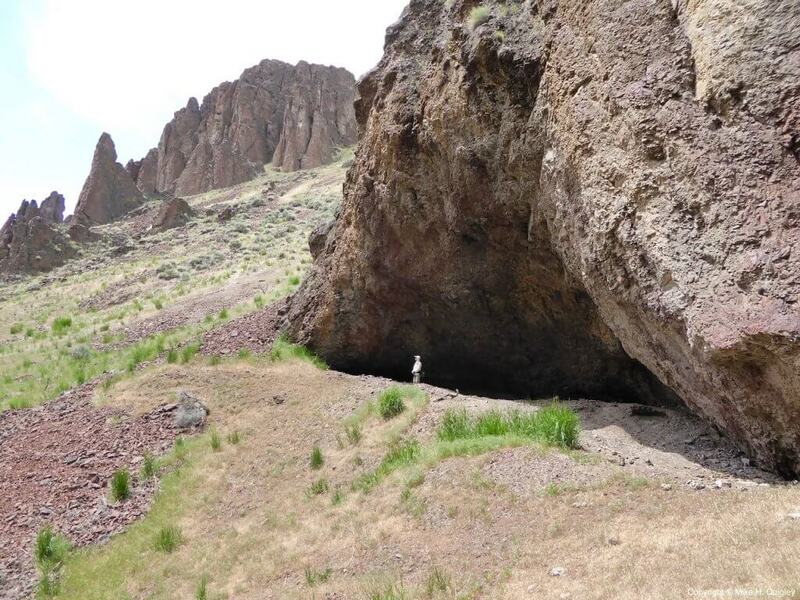 Despite heavy looting, Dirty Shame Rockshelter (thus the name) was brought to the attention of University of Oregon Archaeologists and excavated in the late 1980s. (1) This was not the first excavation of Dirty Shame. In 1937, Luther S. Cressman, a noted archeologist, explored the site. (2) Fortunately, in a limited area of this rockshelter, a large number of artifacts and cultural materials remained untouched, providing valuable insights into human desert culture dating back 9500 years. In other words, it dates back into the Ice Age! What other cultural insights might we have gained had the shelters not been plundered? Good reasons exists for why we are asked to leave what we’ve found where we’ve found it. Artifacts tell the story of place. When they are taken, we lose that history. And, to the indigenous communities, they represent the spirit of the person who made the object. Both reasons deserve our respect.